After returning from two incredible months in Botswana I had well and truly caught the travel bug. On top of this, I was also well and truly broke, so decided to start searching for another volunteer program in a new location. Ireland lived up to its reputation of a small community as a friend of a friend turned out to have just what I was looking for and in Ecuador of all places. Landing in Quito airport is an experience in itself, you fly through a valley so as you look out the window of the plane it feels as though you could touch the Andes. After a night in Quito I made the trip down to La Finca (little farm) where I would be based for the next three months. For the entire two hour drive I sat staring out the window, jaw dropped wondering how I had never considered coming to this country before. My initial thought was that it looked like Ireland on steroids, but then when Cayambe volcano came into view that comparison went out the window. We were based just outside a little village called Pesillo which sat at 3,200 metres above sea level. Pesillo was small and rural and oozed South American culture. The women dressed in vibrantly coloured clothes which were topped off by hats that their long dark hair hung out the back of, plaited and wrapped with ribbon. The majority of the men (especially those who lived higher up in the mountains) had horses to carry them, and whatever they might need, to and from the village. These men would refer to themselves as Chagras (cowboys) and dressed equally as traditionally as the ladies with long chaps and woollen ponchos. To be able to live alongside the locals rather than as a tourist was what made my experience here so special. We rode down to the village every Monday and filled up our saddle bags with fruit and veg from the market, we got our daily litre of fresh milk from the guy who kept cattle at the end of our land (who handed it over to us still warm). Once a week we’d get the 40 minute bus to Cayambe to do our big shop. We spent the majority of our time here in the market negotiating the price of fruit and then sitting among the locals eating a massive meal of fried chicken, rice and chips with a hot tomato arbol sauce and a 70 cent smoothie the size of our heads. There were three volunteers (and two dogs) and we all lived together in a small yellow house by the river. 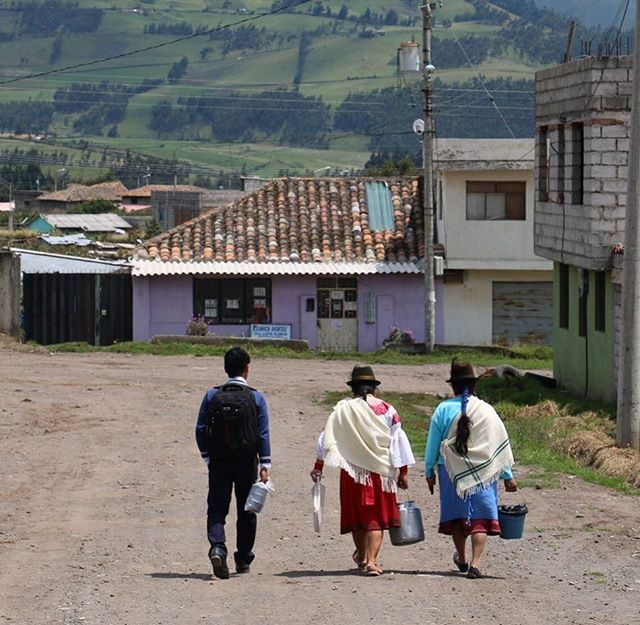 If you stood outside the front door and twirled around, you had a bright green mountain looking over you on one side, a snow-capped volcano on the other and páramo (above the forest line below the snow line) directly in front of you with small villages dotted across it. With this view from our front door you can only imagine what the views were like when we went out riding. We rode the horses out every day and yet not one day was the same. We would walk out the gate of La Finca and just go. 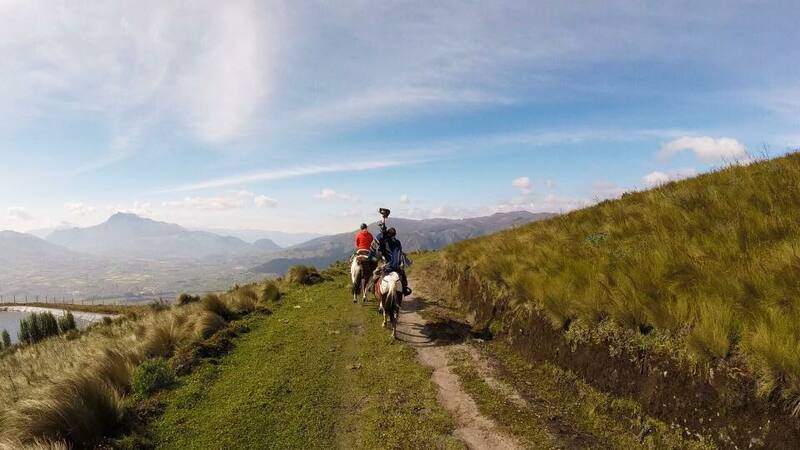 Some days we’d be out riding for 6 hours up to as high as the páramo grasses to look down over the breath taking landscape. 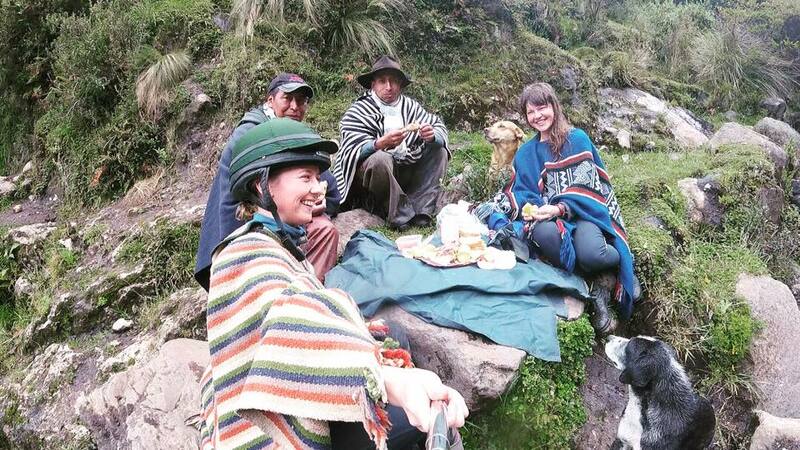 Other days we’d pack our picnics and ride up towards the snow on Cayambe volcano, venturing off the beaten track to stop and swim in the hidden hot springs. 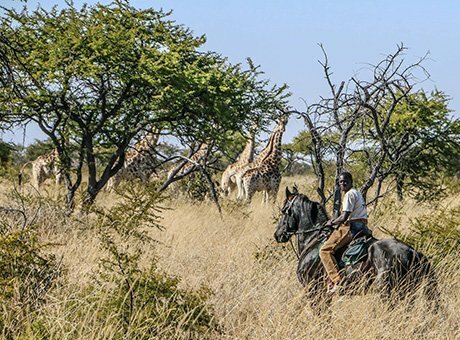 The horses can take you to places that you wouldn’t dream of walking. The higher you get the heavier their breathing becomes as the air thins. No matter how high we went there was always life up there. A farmer out milking his cows, a young boy cantering down the mountain on route to the village. The majority of the land is cultivated and with a tropical climate food is always plentiful. Apart from one or two very large farms all the work is done by hand. When we were out riding, especially on the weekends, we would often see large groups of people sitting together eating their lunch after pulling up acres of potatoes or onions. The sense of community was something to be admired. On the contrary we would also often see ladies sitting alone with their dog and herd of sheep as they ate fresh pasture until night fell and it was time to bring them back to the safety of their home. On the days we rode through the village, if we were early enough we’d stop by one of the houses and buy ourselves freshly baked bread filled with either chocolate or pineapple and eat them as we headed off on our next adventure. Other days we’d tie the horses up beside us in the village as we sat and ate in the local restaurant. Near the end of my time at La Finca a group of guests came for a seven day tour. This was like hitting the jackpot. 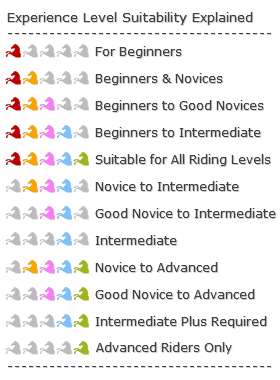 Despite the fact that we worked from dawn until dusk every day of it and the whole month before trying to get horses fit, it was 10,000% worth it. It started off in a village called San Pablo. Children would scurry out of their houses to watch us ride by and begin to wave madly saying ‘hello’ while giggling with excitement. Pigs were tethered up outside houses and every now and again would be woken by our presence, this would lead to terrified horses as the ‘lump of dirt’ suddenly shot up and snorted. This village -like most in Ecuador- was on the side of a mountain, however it had the advantage of looking over the beautiful San Pablo Laguna. The following day we climbed up 800metres and sat and ate our picnic looking out over miles of enriched landscape, San Pablo was now a tiny dot below us. 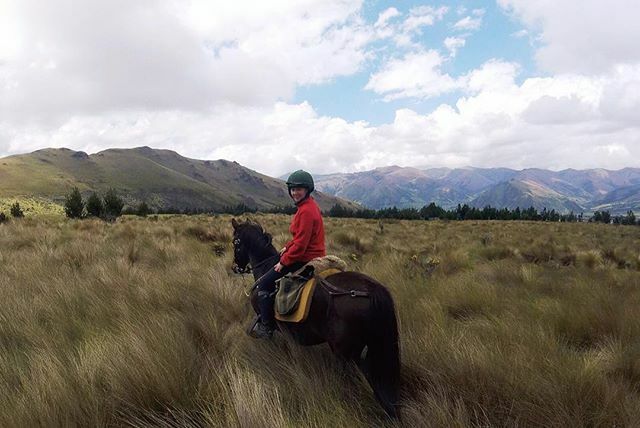 A new set of horses were loaded up and travelled the four hours towards Cotopaxi. This is where we would be riding for the remaining four days. 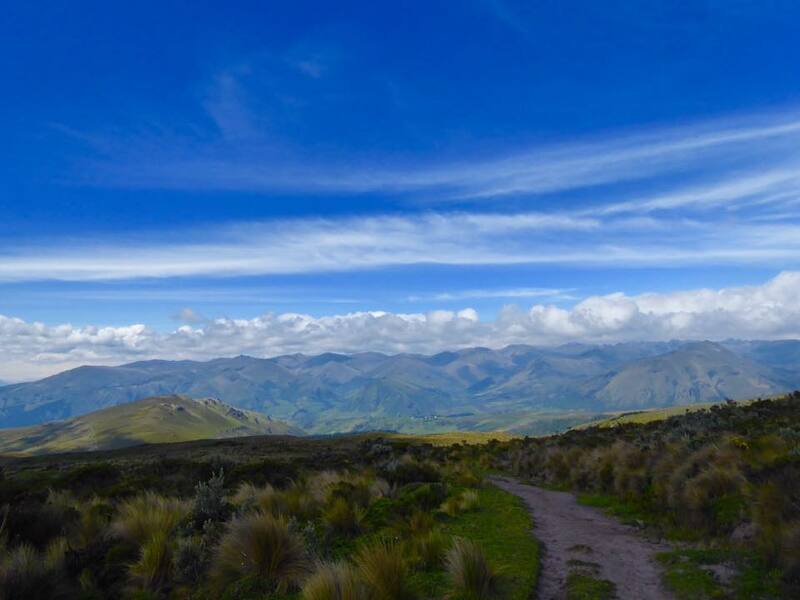 Cotopaxi National Park is out of this world. When we entered the park we all started to canter, Sally however had spotted a herd of wild horses galloping so we quickened our pace and managed to tag in alongside them. 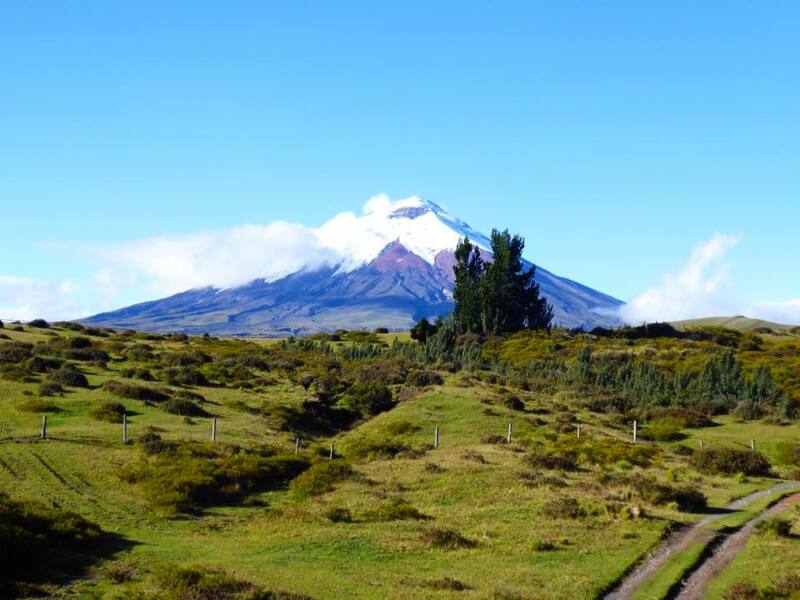 As you ride through the park you are surrounded by volcanos, at one point you have one on either side of you, with Cotopaxi topping them all with its snow white top. Condors are becoming rare in Ecuador however we managed to get a sighting of six all at once. You know this is amazing when you have the local guide jumping up and down with excitement. Contrary to the first half of the tour the national park doesn’t allow any inhabitants on the land, this as well as the rich red soil and the large mounds of rock randomly dispersed from natural disasters, gives you the feeling that you have gone to a different planet. The diversity in what you see from one day to the next is unthinkable. You won’t believe it until you see it. From the lush green of Hacienda Zuleta to the stark land which surrounds Cotopaxi, they are like two parallel worlds. As we cantered by Cotopaxi volcano Sally informed us we were at 4,000 metres, the highest canter you can do in South America. This all became relative to me when I realised that was the height I once skydived from and was now sitting on a horse at. I’ve been home for over five weeks and it has taken me until now to allow myself to thoroughly think back on those four months, because only now could I do it without simultaneously booking a flight back. Ecuador’s phenomenal beauty can been seen in pictures but the atmosphere and warmth of its people can only be felt by being there. My fear now is that I’ll never experience anything or anywhere as incredible again.